I had to make a hard parenting decision this week. So, of course, I overthought it, wrung my hands in worry, and talked myself off and on the ledge. Because that’s what I do. For the past year, I’ve been planning a trip back to New York City with Mercy House to launch our fall wholesale line. Remember my panic attack on my first trip there? And a recap from this past February of what God did? It’s an important trip for our non-profit and one that I’ve been excited to make. I’m heading to Kenya with a team next week to teach what we plan to launch in NYC in August. I love this part of my job: birthing new ideas, creating jobs for women in poverty in a slum in Africa and then launching those items in a wholesale market. Honestly, it makes me feel like I’m changing the world. This week I received the dates for when my daughter is leaving home and moving into her college dorm. They are exactly at the same time. For hours, I looked a flights and tried to juggle doing both. I told myself and my daughter I could get her packed up and ready to go the week before I left for NYC and then hurry home and drive her that night to her college campus two and half hours away. My daughter said she understood because she knows how amazing the wholesale market is and how important the event is to me. But important events are never more important than people. Sometimes you get to preach truth and other times you get to swallow it. And sometimes when you really want to change the world, you just need to go home and love your family. When my daughter got home late from work one night this week, she came to my bedroom and sprawled across my bed. She was wiped out from six hours on her feet at her retail shift. I told her I wouldn’t be heading to NYC after all for the wholesale market. Oh my heart. I looked at my little world changer who has made more sacrifices than most teenagers her age and I felt so much compassion for her offer to lend me to Mercy House one more time. “I’d rather be with you. I think we’re going to need to the week to say goodbye and get you ready for your new adventure,” I replied. The look on her face made me feel like I was really changing the world. And when we love our families well and really listen to their needs and respond the best way we know how? That’s exactly what we are doing. We don’t need a trip across the ocean, a non-profit to lead, a trip to the Big Apple to remind us that we are changing the world. We just need to go home and love our family. Gosh, your post reminded me of my teenage years. Growing up my mom and I were Catholic and my dad was Protestant. It seemed he was always away at a church function when important things were happening in our home (birthdays, festivals, anniversaries etc.) I always missed him so much. Now that I’m older I realize that in my case my dad had a hard time coming home and loving his family (he felt guilty for missing out on church) – he would be there 3-4 times a week. It was hard to watch him struggle. I think Jesus wants us to love our families and be with them. Kudos to you for being with your girl. Oh Kristen! I really don’t have words to say on this one, but just want you to know that I am praying for you and your family. I really am! Ministry is hard work! Those moments that you share about your kids and wondering if all the sacrifices have been worth it…yep, I wonder those too. Thank you for always being open for those of us who struggle with that. 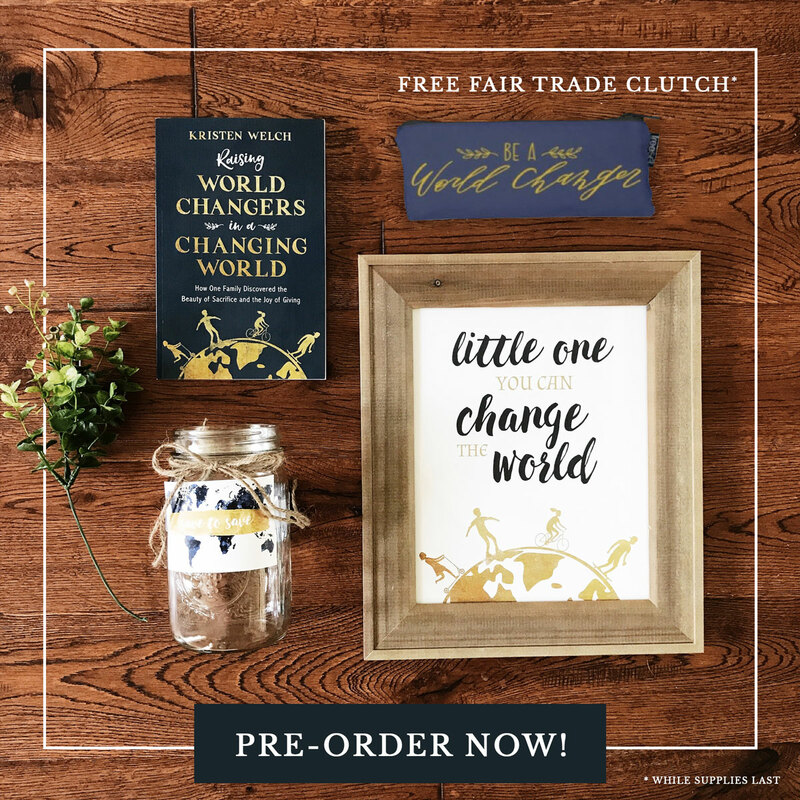 Your kids are world changers! 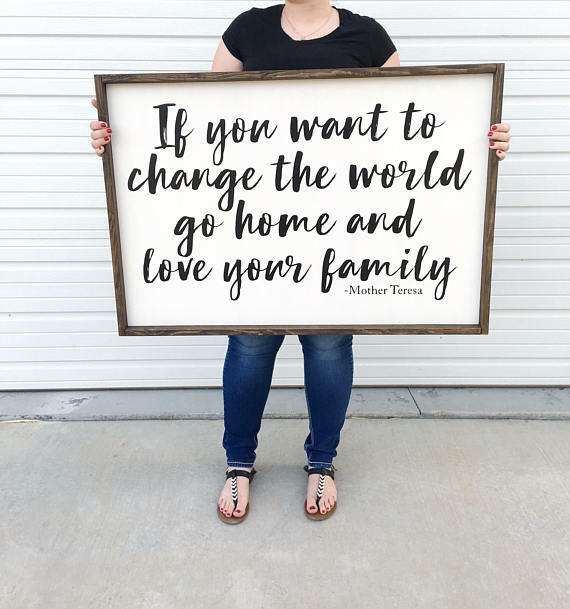 Your family is a family of world changers! You, my friend, are an awesome mom and I know this because each time i have gotten the privilege of speaking with you, you share your mama heart almost instantly and that is what I love about you! Thank you for being you and for loving Jesus, loving others, and loving your family! you can click on the picture above and buy the one in the picture! Yes, that is how we change the world. You have given a practical, down to earth reflection of Titus 2: 4, reminding other moms to love their children. Thank you for expressing it so powerfully! Oh, I felt every bit of this! My daughter leaves for a semester abroad to Cape Town, South Africa (!) the same time as I was asked to participate in a youth group mission trip for my son’s youth group. I went back and forth for days. Finally decided on the mission trip – Loving my family and leaving my family no matter what I chose. 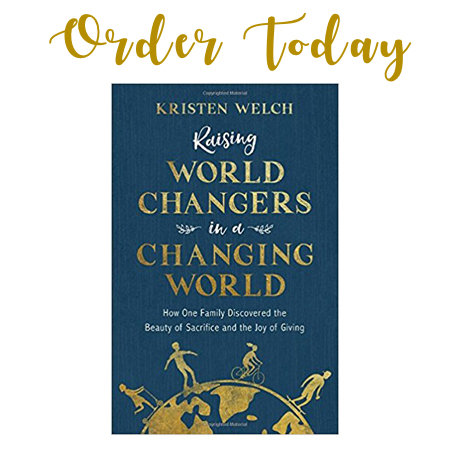 Parenting is hard and we’re raising world changers…but they still need their moms. Thank you sovery much! I needed this reminder and confirmation of choices I have made!! Kristen, it seems ridiculous to have to write this, but THANK YOU for putting your family first. You will not regret one moment (even the gut-wrenching drive back alone from dropping off your daughter) being able to experience the packing and decisions and loading/unloading the car, walking campus, making her bed one last time… You can’t get any of that back by not being there. Enjoy your time with her! I believe you have chosen wisely. Thank you for acknowledging the struggle – you will not regret this. Beautiful and perfect, timely reminder! Kristen, you will never regret the time of packing together and driving your girl to college. It’s time you will forever appreciate. Our 2 oldest have been out of college for years now, but I remember…like it was yesterday what “mom emotions” poured out…I can see the looks on their faces as we said, and then waved good bye. I can already “feel” what this will be like again for our youngest…who is 2 years out yet. You’ve chosen wisely!! Bless you! Now…how bout that Mother Theresa quote? Where can it be purchased on canvas like you show it? Thanks tons!! Click on the picture above and you can get it on etsy!